The Gason Design Review Team have long recognised that in many Australian cropping districts, soil compaction by large machinery can be a major problem, and controlled traffic equipment is becoming necessary for greater on-farm efficiency. Soil compaction increases stress on plants and reduces their growing potential, as the root system struggles to penetrate the compacted layer. When whole farm controlled traffic systems are implemented, yield improvements of around 15 percent have been recorded for differing soil types. As well as these yield benefits, farmers are experiencing higher accuracy for seed, fertiliser and chemical - and therefore reduced costs of those inputs, and fuel. A key benefit of permanent wheel tracks is the elimination of soil compaction in the crop's root zone. Controlled traffic farming can substantially reduce tractor power requirements, because it reduces the energy required for consistent traction and it eliminates the need to till compacted soil. Larger implements can be pulled or the work rates in the paddock increased. Alternatively, it allows smaller tractors to cover larger areas. There is reduced opportunity for erosion and more effective waterlogging control, and generally improved efficiency across all operations. Many farmers are seriously considering reorganising their equipment to match permanent wheel width tracks. The major focus now for a large percentage of broadacre operations is on three metre wheel tracks. 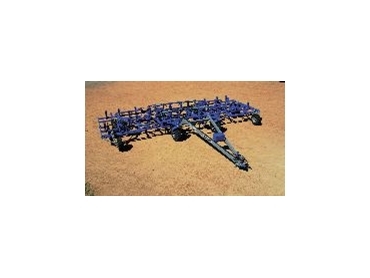 The width of cut for cultivators is generally focused on 12 metres, depending on traction capacities, width of boom spray being operated and the header being used. Anticipating this increased farmer demand for three-metre wheel track, Gason has developed a range of air seeders and cultivators to suit that configuration. The widths suit 9 metres and 12 metres (29.5' to 39.4'), but the significant factor is that the frames can accommodate six different tine layouts. Tine spacings are 200 mm, 250 mm and 333.3 mm (8", 10" & 13"), with or without centre tines. 1. A spring release tine with a shock absorbing pad having breakout pressures of 1780N (400LBF) - 2400N (540LBF). 2. A hydraulic tine with a low and high range. Low being 445N (100LBF) - 1335N (300LBF) and high being 1335N (300LBF) - 2890 (650LBF). In-frame tyres - 15.5/80-24 - 'Gripster' style. Front castor tyres - 335/80 R18 Michelin XM27 - ‘Gripster' style. Another innovation especially for the 3 metre controlled traffic concept is the development of the new ‘up and over' Gason floating hitch drawbar. Designed to locate the attachment points on the frame as wide as possible for increased stability in pulling and tracking, it provides clearance for the castoring front wheels during tight turns, and allows fitting of larger Gripster-style tyres for better flotation. Gason's dynamic team are passionate about staying abreast of the agricultural trends and market needs. “Our innovative and progressive nature will show this in the products we supply to our Australian farmers”, says national sales and marketing manager, Brad King.